When Steve Cummings rolls out for Great Britain today at the world time-trial championships in Qatar, it will mark only the latest episode in an extraordinary story whose first significant chapter opened at the decidedly less glamorous (and chillier) Eddie Soens Memorial Road Race in 1999. Back then, when riders lined up for an event on the domestic calendar, few would have predicted that an unfancied junior was about to lay the foundations of a reputation as one of the hardest working riders of a generation. Cummings blew onto the scene by becoming the first junior to win the Eddie Soens. To this day, he is still the only junior to win the race in its 46-year history. Riding for his local club, Birkenhead North End CC, he went on to win thejunior national road race title the same year. It wasn't long until the national squad took notice of Cummings, with the intention of utilising this young rider’s obvious ability on two wheels. Following the passage taken by many young riders on Team GB’s recent programmes, Cummings soon racked up multiple successes on the track as a team pursuit specialist. He stepped onto the podium eight times between 2001 and 2006, at Olympic and Commonwealth Games, and at world championships. A selfless team player, Cummings would often sacrifice his own ambitions to follow a team agenda. A prime example? Witness his ride at the 2011 world road race championships, where he rode for Mark Cavendish, helping to launch the Manx Missile to rainbow jersey success in Denmark. Cummings’ modesty and friendly demeanour enlarged his fan base, but also saw him gain respect within the peloton. Hard work is rarely overlooked, and 2015 would prove a turning point for Cummings. His first WorldTour victory came on stage 14 of the Tour De France. His ride into Mende in the colours of MTN-Qhubeka represented a significant double: a first Tour stage victory for Cummings and for an African cycling team. Fast forward to September 2016, and Cummings returns to the UK for the Tour of Britain, having just ridden the Olympic road race after a last minute substitution. The Wirral man has unfinished business with the national tour: in 2008 he finished second in the general classification while riding for Barloworld. Still the selfless team player, Cummings has also shown the ability to pursue his own agenda in the intervening years, most recently at the Tour, following a second career stage win at cycling’s greatest race. Cummings rides the Tour of Britain in signature style: powerful and measured. In a reversal of roles from their world championship triumph in Denmark, Cavendish sacrifices his own chances, ultimately enabling his team-mate to claim the race lead. Cummings pulls on the yellow jersey of race leader after a strong ride to fourth place on the first engagement of a split seventh stage in Bristol. In a time-trial contested by some of the world’s best in the discipline, Cummings finishes in a strong fourth place. Only three-time world ITT champion Tony Martin (Etixx-QuickStep), world championship silver medalist Tom Dumoulin (Giant-Alpecin) and former world hour record holder Rohan Dennis (BMC Racing) are quicker. Cummings’ performance against the clock, and in a controlled performance in the stage 7b road race, is enough to propel him to the race lead. He will carry the yellow jersey into London for the following day’s final encounter. Despite his new status, Cummings retains his reserve, openly confessing that he is happy in the shadow of Cavendish and Sir Bradley Wiggins. He has no interest in celebrity status, claiming: “I’m a simple guy who just wants to just ride his bike”. September 11, 2016. The final stage of the Tour of Britain. Walking around the course to find the best photo spots before the crowds became four or give people deep, much of the talk among spectators concerns Cummings. 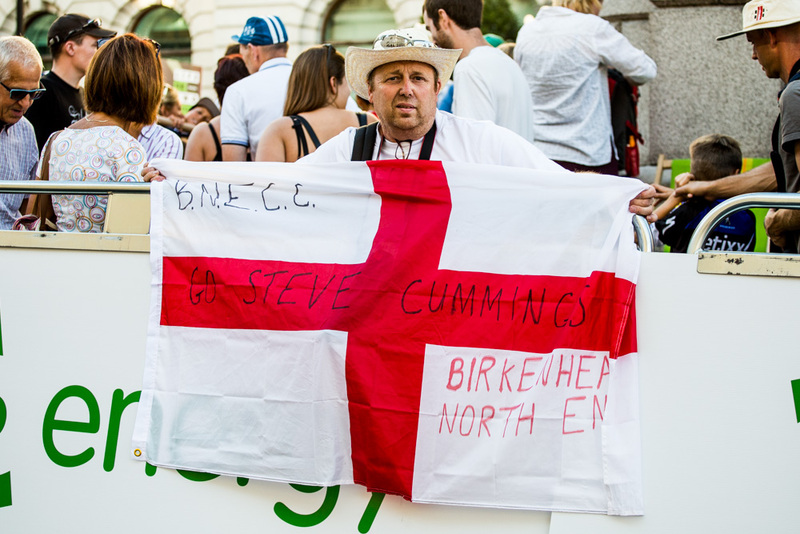 It’s not uncommon to speak to a hardened cyclist and hear them praise the quiet man of the WorldTour’s Brit pack; die hard cycling fans stay in the know by sharing information and opinion during club rides, after all. What is uncommon is to be stopped by passers by (the joy of wearing a press tabard) and to be asked, “Where can I see Steve Cummings?”. What struck me most was that the person who stopped me didn't strike me as a cyclist or someone who may be interested in cycling, looks can be deceiving. I pointed them to a good vantage point and carried on shooting a stage now well underway. London is a great city for bike races. The public are always very engaged, and cheer on the riders with real passion. Cummings and his Dimension Data team-mates rotate near the front of the pack, instead of Steve protecting the team’s potential stage winner, Cavendish. Instead, Cummings is the protected rider, and his yellow jersey illuminates a vibrant scene when the sun cuts through the great buildings of the British capital and comes to rest upon it. Stood above the crowd trying for a photo to capture the atmosphere in London, a lady suddenly shouts to me “Oi, Steve’s coming”. I’m then ushered to the barrier to get a clear shot. I thank her and she asks, “Did you get him?”. Smiles and laughter follow as I show her and her friends the back of the camera. It occurs to me: Cummings is a true British hero - not just to cyclists, but to those outside of the cycling community. Not bad for an ordinary guy from the Wirral. Cummings’ aversion to the media spotlight could stem from his club roots and missing out on the media training to which Cavendish and his ilk were exposed from an early age. Speaking to journalists, Cummings seems awkward and shy, and keeps interaction to a minimum. When asked by a fan for a photo and an autograph, however, he readily obliges, even thanking the well-wisher. 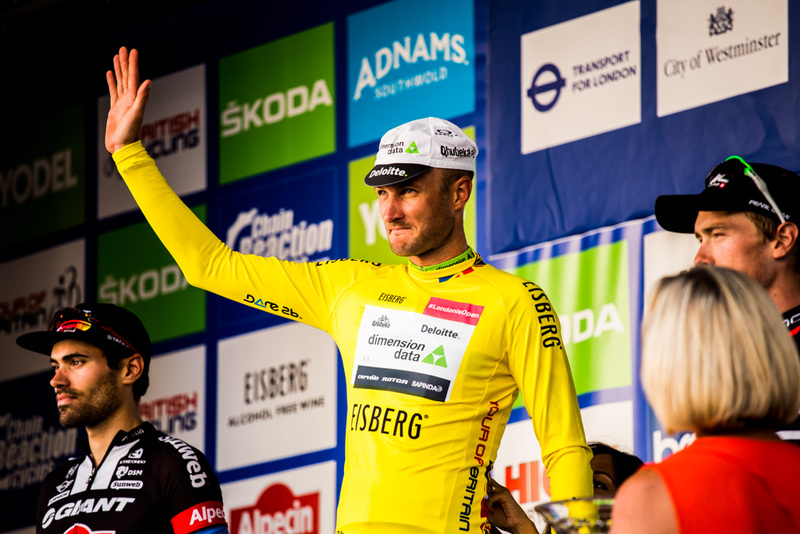 As the racing comes to an end, Cummings and Dimension Data have held onto the yellow jersey, making him only the second British rider to have won the modern incarnation of the national tour after Bradley Wiggins in 2013; a landmark moment in Cummings’ career. Yet he remains subdued and reserved during the podium presentation, seemingly more interested in congratulating Dennis and Dumoulin on their GC performances, before retiring to the team bus. A job well done then. Cummings' return to the UK race scene after a hiatus will remain a fond memory for the British fans. He is without a doubt a British hero to many, although he may not know it. He probably doesn't care too much, but that’s what makes Cummings the cyclist’s cyclist.